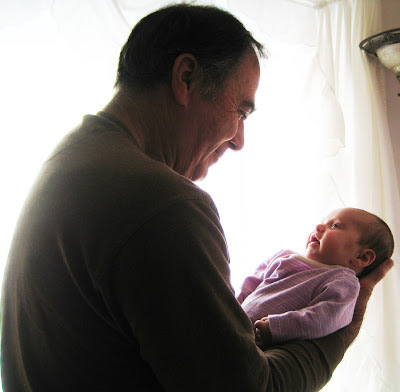 This photo of my dad and Mila was actually taken a couple of months ago when I went to visit my parents over Easter. I'm pretty much in love with it and my dad is too (it was his Father's Day present). He wondered aloud what she might be thinking in this photo and really it's anyone's guess. Although I bet it has something to do with: "What are you just going to stand there and stare at me dude? Where's the milk?" Oh my gosh, this photo is so sweet it just makes me teary. Have a wonderful fourth Alexa! That is a beautiful photo! So sweet! Such a sweet picture! And you are a sweet daughter, too, what a thoughtful Father's Day gift. Have a happy 4th of July weekend, Alexa! Loves her Papa I can tell. Probably thinking "I have you wrapped around my little finger".